AmandaRachLee: How To: Calligraphy & Hand Lettering for Beginners! Tutorial + Tips! 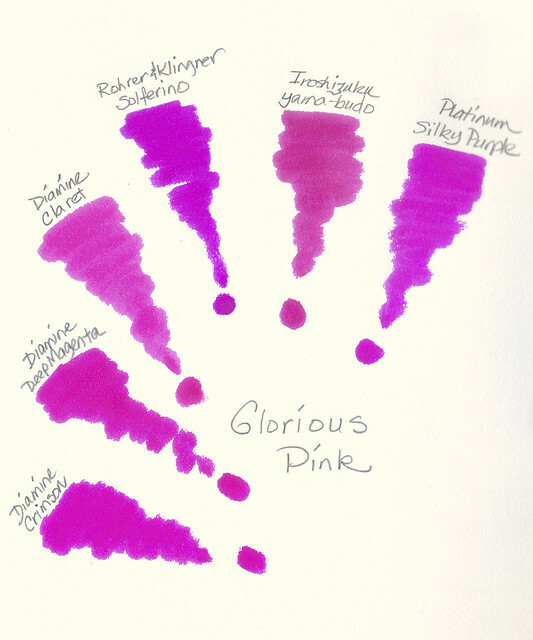 In this case, it’s a family of red inks. 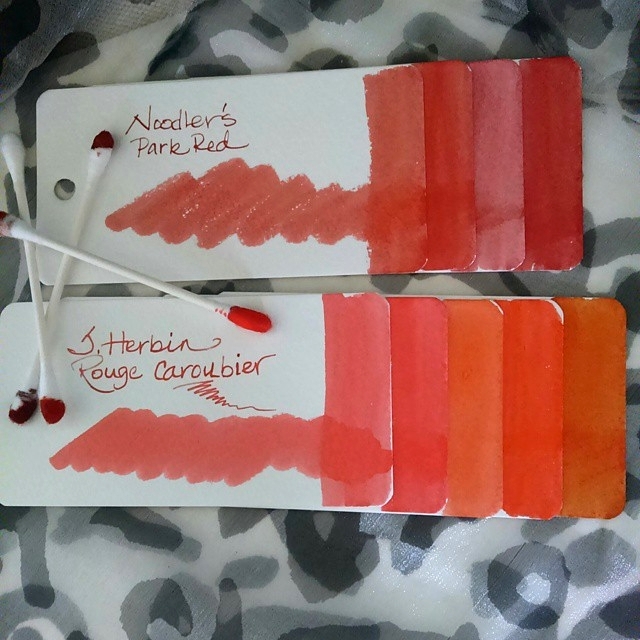 The colors are quite similar and I readily admit to preferring the softer, warmer side of red. 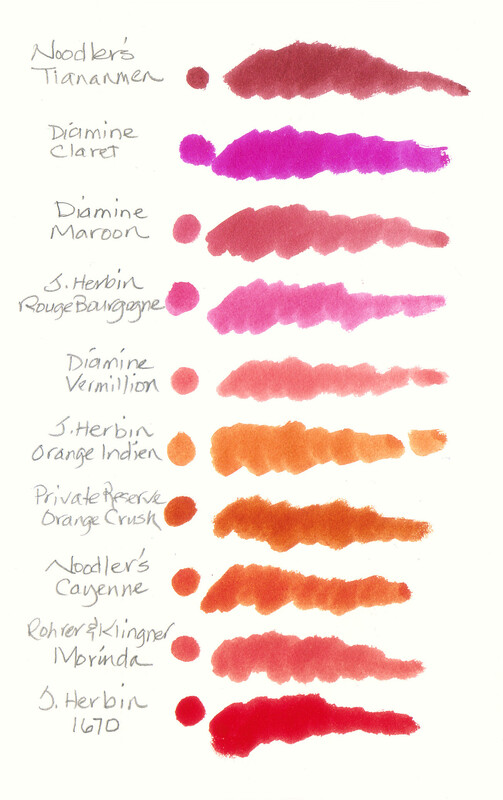 Thus there is a bias in my collection that adding J. Herbin Rouge Caroubier to my color swatches made only more obvious. Warmer weather always brightens my ink rotation. Orange, pink, and a paler shade of green add some fun to the hold-overs from early spring. 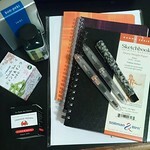 In addition, Rohrer & Klingner Scabiosa is getting a run in the Namiki Falcon SB fire hose. So far – so good with that test. It’s a muted gray-purple that suits clouds more than unrelenting sunshine, but if it tames the beast, it will be a good choice. Frankly, I was surprised to see how similar these pink swatches turned out. Claret, Solferino, and yama-budo are full-sized bottles while the others are samples. Good thing since all six would be redundant indeed. 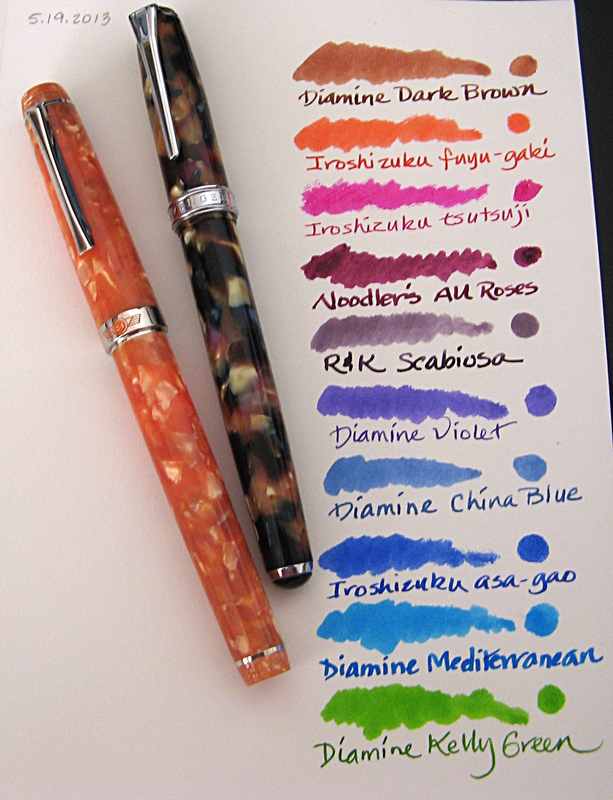 My ink rotation is looking a bit somber for the almost-spring weather with its blue skies and 65° of warmth. Tuesday’s snow has melted from the surrounding mountains. One neighbor’s gardener is whacking off tree limbs while the house across the street is getting demolished in favor of a boring, modern structure. It is far too noisy to hear the birds but they are around even if drowned out by the blare of machinery. Their chatter can be heard in the early morning before the sound of man takes over so with certainty they have returned. New growth is sparse yet, but that lack of color can be remedied by some vivid hues in my pens. Rohrer & Klingner Solferino is my annual choice for the ink that announces the retreat of winter. To complement that jolt of pink, a green is in order. For comparison, I swabbed a few available options on a sheet of Strathmore Windpower Sketch paper. 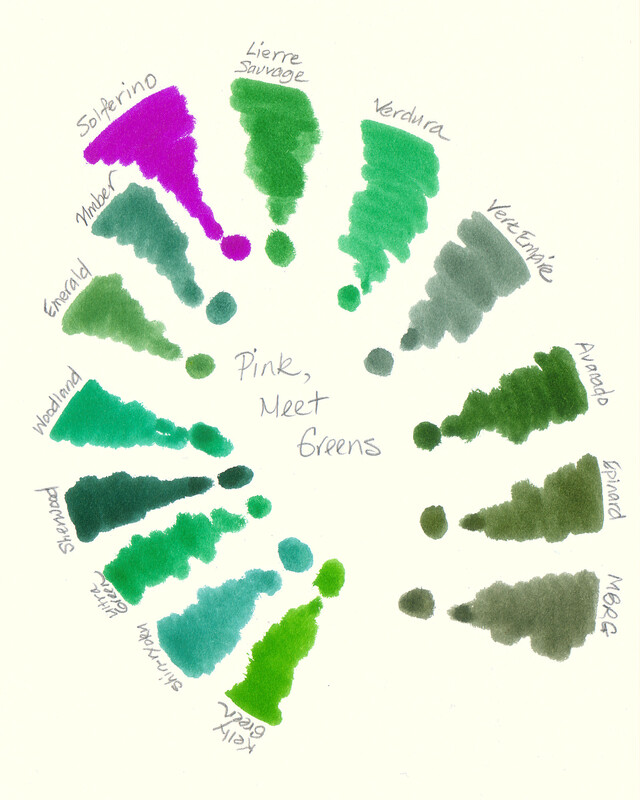 None of these inks look wrong but a few look more right than others. Which green would you choose?